If you suffer from back pain, it may be in your DNA. Researchers have found three mutations that may be linked to the agony that strikes millions of people worldwide. The twists in three genes – SOX5, CCDC26/GSDMC and DCC – are thought to affect the backbone’s development. Scientists at the Department of Veterans Affairs, Seattle, analysed the genes of more than 150,000 people to make the discovery. The three mutations have even been linked to painful conditions such as arthritis and sciatica. SOX5 had the strongest link. SOX5 mutations have also previously been associated with osteoarthritis in the knee, hip and hand and cartilage and skeletal defects in mice. Researchers led by Dr Pradeep Suri then further investigated the three mutations in more than 280,000 people, of which 50,000 had back pain. The findings, published in the scientific journal PLOS Genetics, further confirmed the link between SOX5 and back discomfort. In addition, CCDC26/GSDMC was thought play a role in slipped discs, as well as sciatica. Sciatica is defined as pain that originates in the lower back and travels through the buttock and down the large sciatic nerve in the back of each leg. But in the second probe, DCC was more commonly linked to depression than back pain. The researchers believe there may be a link between the mental-health condition and spinal discomfort. DCC is also known to play a role in the processing of pain in the spinal cord of animals. ‘The results of our genome-wide association study point to multiple pathways that may influence risk for chronic back pain,’ Dr Suri said. ‘Chronic back pain is linked to changes in mood and the role of the central nervous system in the transition from acute to chronic back pain is well-recognised. Despite the large study size, the researchers state bigger trials still are required to determine how genes may be involved in back pain. Lower-back pain affects at least four in five people at some point in their lives, with around one in five sufferers developing chronic discomfort lasting a year or more. 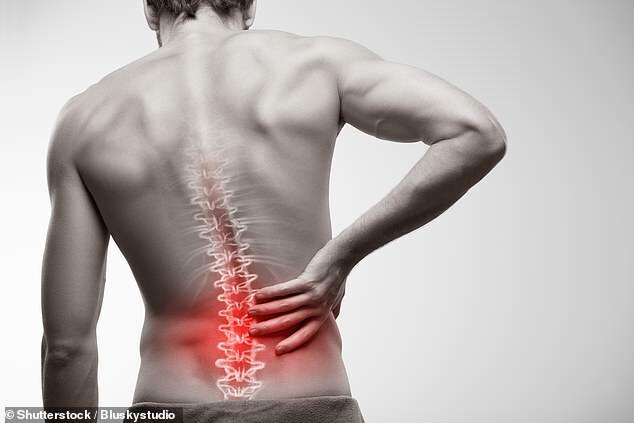 Back pain costs the NHS £2.1 billion a year, and is estimated to set the UK economy back around £10 billion in lost working days and informal care. Americans spend at least $50 billion annually in healthcare costs for lower-back pain alone, according to the American Chiropractic Association. This comes after a Kaiser Permanente Washington Health Research Institute study earlier this year suggested chiropractors really do relieve back pain.